A living human child, from the moment of fertilization on fusion of a human spermatozoon with a human ovum, is entitled to the same rights, powers, and privileges as are secured or granted by the laws of this state to any other human child. The bill was originally authored by Rep. Tony Tinderholt (R) about two years ago and “pro-life” Republicans have been split over the bill because it would subject mothers who abort their children to criminal liability. The bill was killed by “pro-life” Republican chairman, Jim Leach, a member of Prestonwood Baptist Church in Plano, TX. The bill could have been the most effective sanctity of life legislation in the history of the state, protecting unborn children from conception to birth, and holding criminal murderers accountable. Graham, Leach, and those “pro-life” dissenters of the bill claim to believe in the sanctity of human life — some even claim that abortion is murder — yet have no interest in passing legislation consistent with what they say they support. 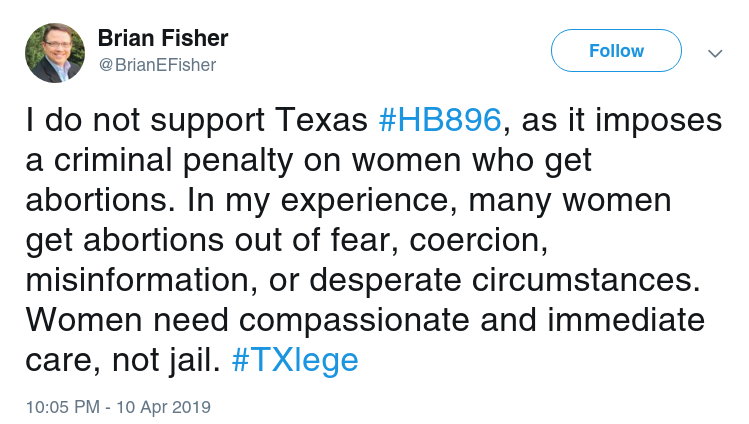 Brian Fisher, president of the Human Coalition — an organization that touts itself as pro-life — also tweeted his opposition to the bill due to the fact that it would hold women accountable for their criminal acts against humanity. Many supporters of the bill are outraged, expressing their dissatisfaction with Leach and Graham’s approval of Leach’s killing of the bill on Twitter. His refusal to grant equal protection to the unborn is wicked, pastor. Saying that unborn victims are not worthy of protection, is discrimination…plain and simple. Unequal justice is no justice at all. You need to repent Jack Graham. You don't need a pastor's approval. You need the approval of #Jesus. Both of you evil men are complicit in mass #murder. Repent. Change your ways. He has now sentenced 110,000 babies to a brutal death. He should be brought up on church discipline. He has failed his duty as a God-ordained magistrate and failed his duty as a Christian. 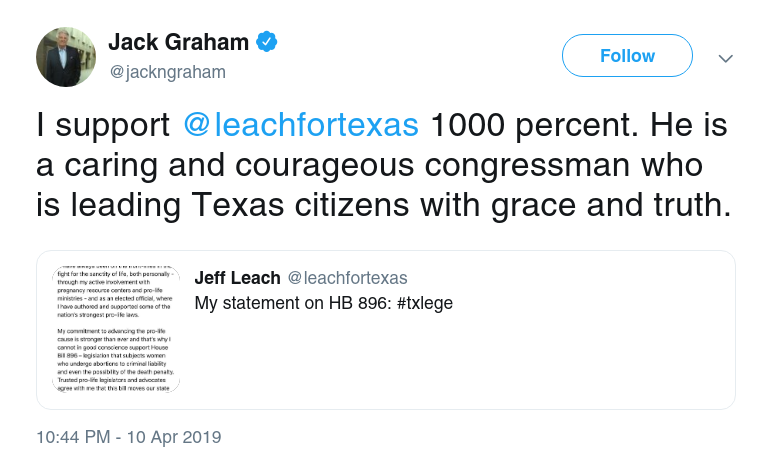 I would concur with the sentiments of those who oppose Leach’s decision — Leach and Graham have the blood of untold amounts of innocent unborn children on their hands. God sees this and will hold them accountable.